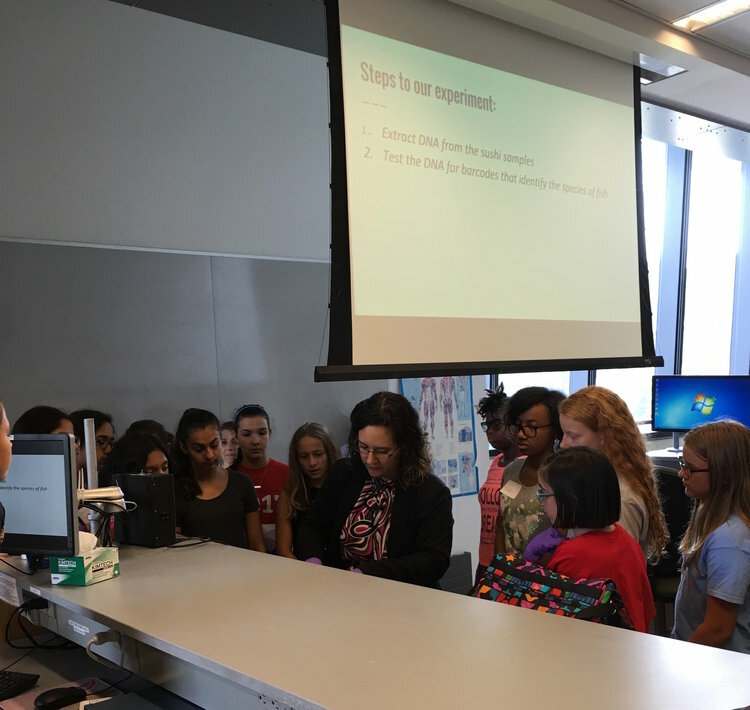 Last month Biomeme teamed up with TechGirlz, a non-profit organization dedicated “to reducing the gender gap in technology occupations, by focusing on girls at the crucial middle school age”, for a Saturday Workshop on DNA detection and Food Science. 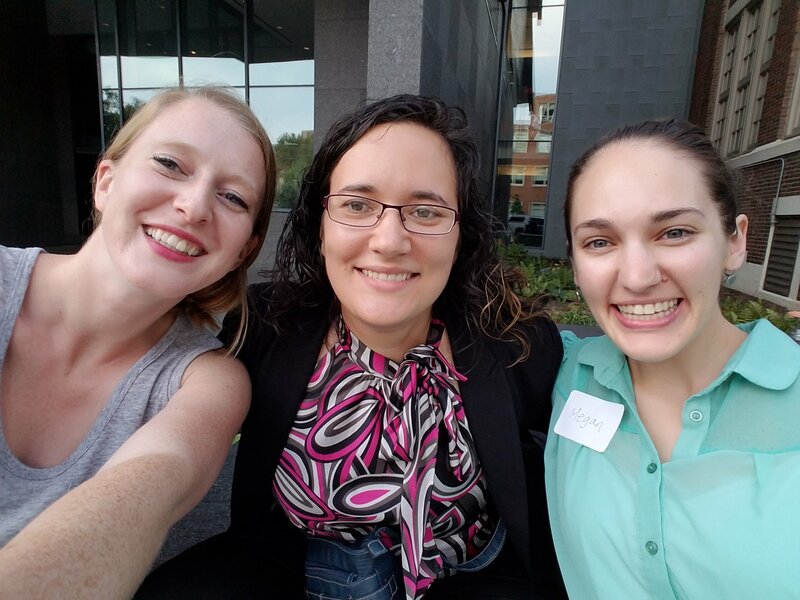 The workshop was the brainchild of two awesome Bioengineering Graduate Students at the University of Pennsylvania – Heidi Norton & Megan Sperry. 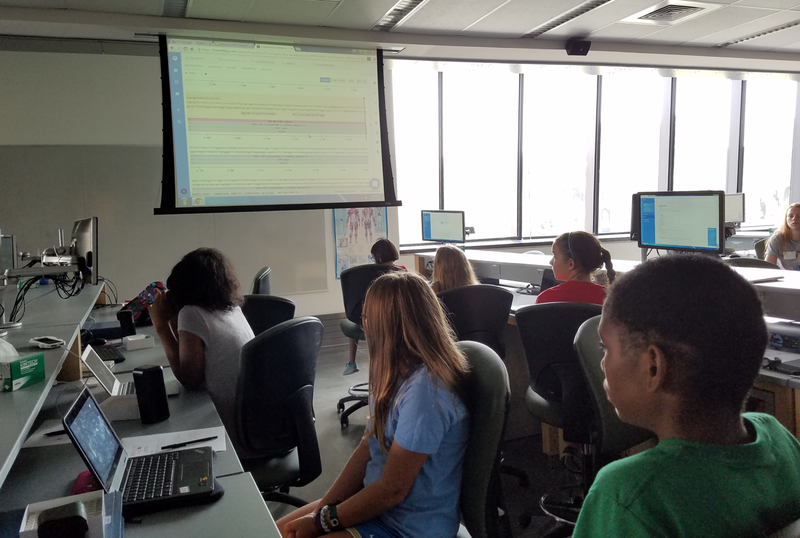 They spent months working with TechGirlz, Biomeme and the University of Pennsylvania so that we could all host a group of extremely impressive middle school girls. We spent a Saturday at the George H. Stephenson Foundation Undergraduate Laboratory nerding out and sharing our love for science and technology. You can check out Megan & Heidi’s post about the workshop on their blog “Beta Pleated Chic” here. 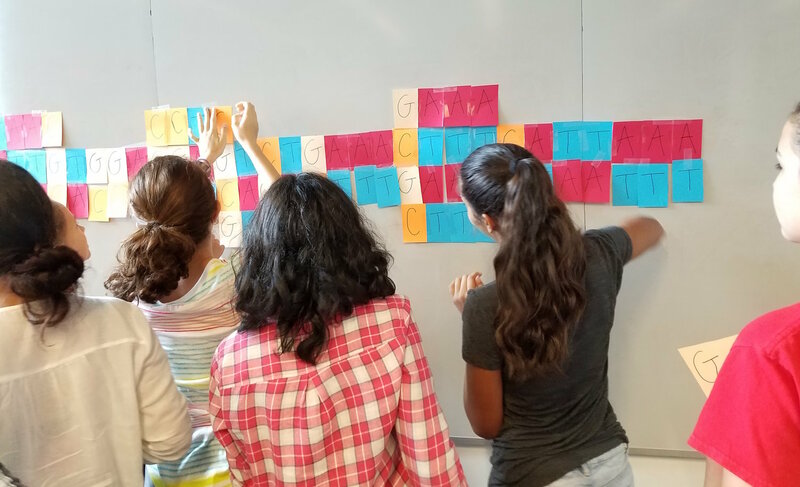 Middle schoolers used post-it notes as a hands-on approaching in learning about DNA and its structure. The participating students learned how the Biomeme smartphone-based DNA detection system can be used to test our food. The students (age range ~10-15) learned key concepts of molecular biology including: What’s DNA? What components make up DNA? What is the structure of DNA? What does it do? Why does it matter? How can we isolate DNA? How can we detect DNA? Why would we want to detect it? Maria demoing how to test sushi using Biomeme’s sample extraction and thermocycler technology. To help teach these concepts, we used Biomeme’s “Fishy Fish” test to answer the question, “Do you really know what’s on the menu?” First, we tested fish samples from different local sushi restaurants (I shall name no names today… but my personal list of “I’ll eat there” restaurants got just a little bit smaller). The Fishy Fish test on the Biomeme device detects a specific DNA signal from Escolar or Tilapia, two commonly used fish substitutes. By running this test, we found out whether we were sold either of these fish as a substitute for “White Tuna” (which should be Albacore tuna), Red Snapper, or Yellowtail. The procedure for testing the sushi with the Fishy Fish kit is fast and simple – the students mastered the procedures quickly. First, to ensure that only the right fish was being tested, each piece of fish was cut with a clean razor blade to expose a clean face (which we could be sure had not touched any other fish at the restaurant). Second, the students gently swabbed the fish in the middle of the freshly cut side and dipped the swab into the DNA buffer to collect the cells and DNA. Lastly, after a quick demo, the students each pipetted a sample into the test tubes and started running their Biomeme two3 thermocyclers. While the reactions ran, we explained the principles of PCR (polymerase chain reaction), which is the underlying technology that allows the Biomeme two3 system to detect DNA in a sample. We also showed the students how to use Benchling – a great online tool to play with DNA sequences, design primers, and also my personal favorite laboratory notebook platform. Benchling allows its users to quickly analyse DNA sequences and create custom primers for PCR. After about 45 mins, all the students were able to look at the results on the Biomeme two3 device and determine whether their fish were Escolar or Tilapia instead of the species listed on the menu. Students learned the basics about Benchling and DNA sequences while waiting for their results. Consistent with previous reports and citizen science studies (1-4), during the workshop we found that 66% of the fish sold to us as “White Tuna” were actually Escolar; about 33% of “Red Snapper”, and none of the “Yellowtail” were Tilapia (phew!). This last result makes sense, as we only tested two samples, and the rates of substitution for Yellowtail are reportedly lower than either White Tuna or Red Snapper. The feedback from the students after the workshop was fantastic. On the post-workshop participant survey most of the students agreed with the statement “Technology is fun”, the average response was 4.8 with a median of 5 (in a scale where “strongly agree” is a 5). Also, when asked about their favorite part of the workshop, the comments were extremely positive. Some of my favorite comments were: “I liked taking samples and watching Biomeme complete their samples. I also loved learning about what kinds of fish can be substituted and how different the substitutes were from what they were marketed as.” and “I loved playing around and watching the Biomeme test out our fish sample. I also liked how we almost worked as scientific detectives and found out what our fish was substituted with. I also enjoyed learning how DNA is found/sampled.” It sounds like the students had almost as much fun as the instructors! Overall, the workshop was a fun and engaging way to spend a Saturday both for students and instructors. I loved seeing the students learn that DNA detection can be applied to answer important questions in our daily lives. Hearing them understand that science and technology is fun and accessible to them was a reminder of why I do what I do, and an extra special reward all by itself. A big shoutout to TechGirlz and the ladies of Beta Pleated Chic for making this happen! To learn more about Biomeme’s technology and how to partner with us for future workshops, please contact us at biomeme@biomeme.com. TechGirlz is a 501(c)3 nonprofit dedicated to reducing the gender gap in technology occupations. We develop fun and educational hands-on workshops, called TechShopz, and an annual Entrepreneur Summer Camp. These efforts aim to get middle-school age girls interested in different kinds of technology and demonstrate the varied options of careers available. We enable them to interact with professionals who have carved out successful careers in technology fields, and empower them to be future technology leaders. Fish DNA Barcoding. FISH-BOL Available at: http://www.fishbol.org/. Johnson, K. Survey Finds That Fish Are Often Not What Label Says. The New York Times (2013). Available at: http://www.nytimes.com/2013/02/21/us/survey-finds-that-fish-are-often-not-what-label-says.html?_r=0. Oceana Study Reveals Seafood Fraud Nationwide. Oceana Available at: http://oceana.org/reports/oceana-study-reveals-seafood-fraud-nationwide. Wong, E. H.-K.; Hanner, R. H. DNA barcoding detects market substitution in North American seafood. Food Research International 41, 828–837 (2008).